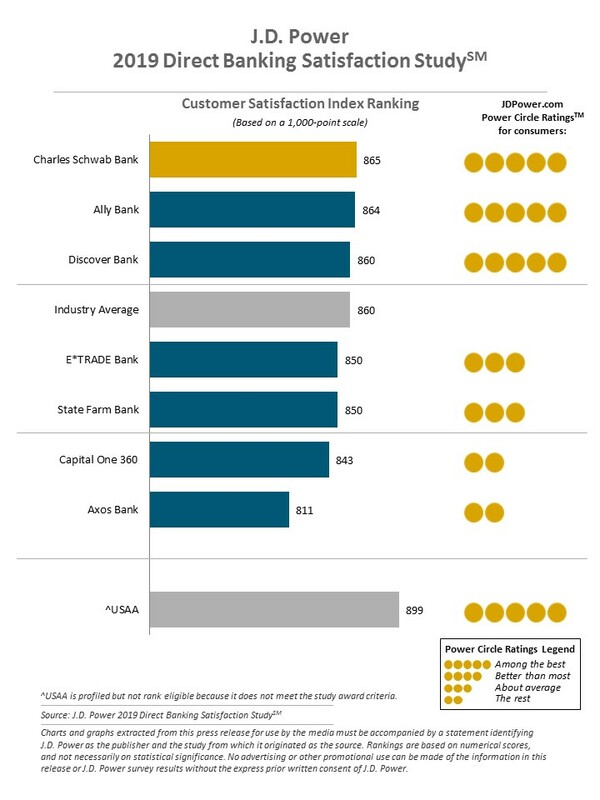 The survey found the top-rated banks are: Charles Schwab Bank (ranked highest in overall satisfaction with a score of 865); Ally Bank (864) ranks and Discover Bank (860). These top-rated online banks were rated higher than traditional banks in the areas of products and fees; communication; and problem resolution. Each of the top banks had different areas of strength. For instance, the survey found that Charles Schwab Bank rated high in website satisfaction, while Ally Bank was ranked “significantly higher than average” on its competitive interest rates. The survey also noted a distinct age difference between online bank customers and those of traditional banks. About 61% of direct bank customers are comprised of Generations X (people born between 1965-1976); Gen Y (1977-1994) and Gen Z (1995-2004). These age groups account for just 45% of customers of traditional retail banks, while direct bank customers are “considerably more likely” to use mobile payment apps (66%) than their traditional retail bank customer peers (49%). So What About Traditional Banks? The news here is not great, the survey found. Customers of traditional branch banks were less satisfied than those using online banking and they became less satisfied over time. Worse, the survey found that “longer-term customers are also less likely to reuse their direct bank for their next banking product.” This means more customers are shopping around for new bank products and services, either online or at a new bank. 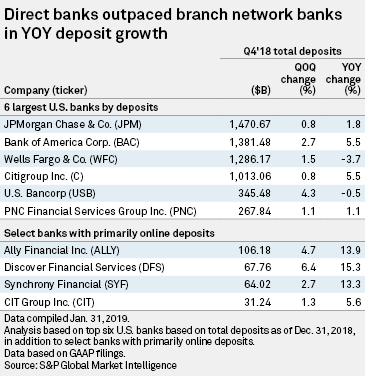 A February 2019 study conducted by S&P, found that the nation’s largest banks saw a decline in deposits of about 5% growth or less. Wells Fargo and U.S. Bancorp saw their deposits decline year over year. Wells Fargo has had significant PR problems dues to its activities in creating fraudulent customer accounts and is still suffering from the fallout of the mortgage fraud that helped precipitate the 2008 recession. To counter the trend, traditional banks (Goldman Sachs Group and Citizens Financial Group) have rushed to offer new interest rate and online products to attract new depositors.